Two faculty members in the Department of Agricultural Communication, Education, and Leadership (ACEL) were recognized with awards at the Association for Communication Excellence (ACE) Conference, recently held in Scottsdale, Arizona. 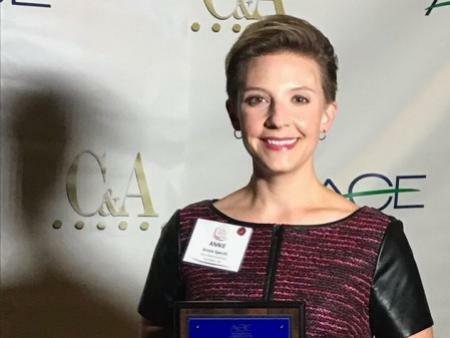 Annie Specht, assistant professor of agricultural communication, received the Award of Excellence in Teaching from ACE. Joy Rumble, who began a new position of assistant professor of agricultural communication at the Ohio State ATI campus was presented with the Award of Excellence in Research. “Although Dr. Rumble received the award for research as a faculty member at the University of Florida, we are excited to have her become a part of our department. This award exemplifies why we recruited her to be part of our team,” said Kitchel. ACE is an international association of communicators, educators and information technologists. The organization offers professional development and networking for individuals who extend knowledge about agriculture, natural resources and life and human sciences. ACEL prepares communicators, educators and leaders in the food, agricultural, and environmental sciences to integrate research-based learning, practice and engagement, in ways that will advance positive changes that strengthen individuals, families and communities. For more information on the undergraduate and graduate academic programs and research available in ACEL, please visit acel.osu.edu.